Dear axolotl: Why do you have feathers growing out of your head? Axolotl: They aren't feathers—they're gills! They let me breathe underwater. Let's face it. Even as babies, we humans pay close attention to faces. Observing another person's features and expressions tells us whether they are happy, angry, excited, or sad. And when we look at an animal, it's hard not to imagine that its face is communicating human feelings. This isn't true, of course. Squinty eyes, an upturned mouth, or another odd expression is probably there because, in some way, it helps that animal survive. Packed with many cool facts and visuals on where certain animals live and what they eat, this book captures twenty-five humorous—and very true—explanations of why animals look the way they do in order to exist in this world. "From a skilled team, another intriguing invitation to explore the animal world." "It's a splendid introduction and a memorable read-aloud for young children." * "Loaded with nuggets of information and layered in humor, this is a winning picture book that is sure to inform as well as entertain." 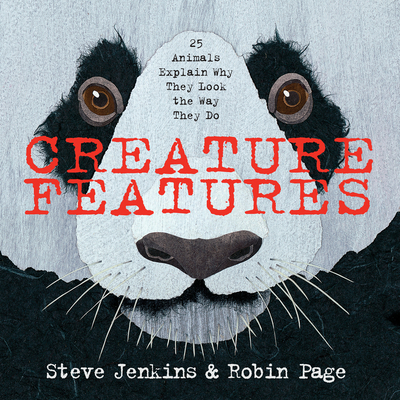 * "Jenkins's torn-paper creations emphasize the idea of interspecies dialogue—readers stare face to face with the animals, who happily divulge what makes them special." "The language of the questions is funny, varied, and irreverent, and the answers are as personable as they are compactly informative...Though the text is accessible for reading alone, the Q&A format is a natural for a lively and unusual readaloud—funny voices optional but recommended."